Long-term followers of this blog know that Katy George burst onto it back in March, when she came across a perfectly preserved letter of Kittie’s in a charity shop in Deal, Googled on Kittie, found us, and offered the letter to the Calderon archive. As I said at the time, it was a sensational discovery that on its own justified the whole existence of the blog since July 2014. However, another marvellous thing was that Katy became really interested in George and Kittie, and has gone to great trouble to find any further items of Calderoniana on the Net that there might be. Thus in May she spotted that an antiquarian bookshop in Tasmania had a copy of George’s satirical novel Dwala not only inscribed by Kittie to the Polynesia expert Frederick O’Brien, but containing an extremely interesting letter to him! Naturally, we snapped it up. The book was very nicely published by Jonathan Cape in 1937, and the slip of paper with Housman’s and George’s signatures was inside it. 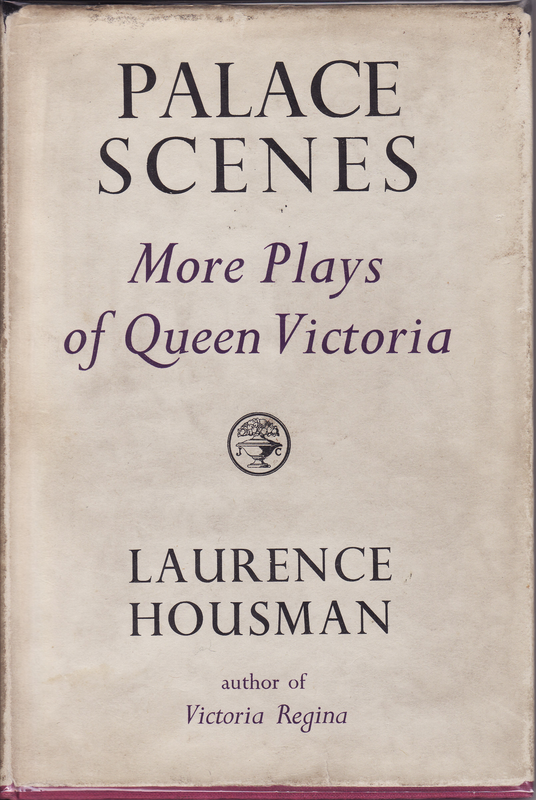 Laurence Housman (1865-1959) was a prolific writer whose 1934 play Victoria Regina could only be staged 100 years after the Queen’s accession, i.e. in 1937. It was a great West End success, with Helen Hayes in the lead, and even went to Broadway. There have also been several stage adaptations of it since. The book that Katy found comprises twelve scenes from the life of Queen Victoria which, Housman explains in his Preface, are not so much a sequel as a ‘supplement’ to Victoria Regina. They are quite hilarious, and very well written. Since the book contains these two signatures, I thought there might be a connection between Housman, Victoria Regina, and George. After all, Housman and he were of the same generation, both active in the London theatre, and George had a genius for collaboration. Now I am very doubtful. As a popular novelist, poet, children’s writer and illustrator, Housman was at home in the commercial theatre, whereas George’s theatrical world was that of the New Drama, Stage Society and repertory movement. Moreover, their political views could not have been more different: Housman was a committed socialist, a pacifist, and co-founder of the Men’s League for Women’s Suffrage (much mocked by George in his Woman and the State). It is very unlikely, then, that they were friends or collaborated in the theatre. This entry was posted in George Calderon, Personal Commentary, Timeline and tagged A Shropshire Lad, A.E. Housman, biography, comments, George Calderon, Joseph Conrad, Katy George, Kittie Calderon, Laurence Housman, Men's League for Women's Suffrage, Peace Pledge Union, Victoria Regina, William Rothenstein. Bookmark the permalink.